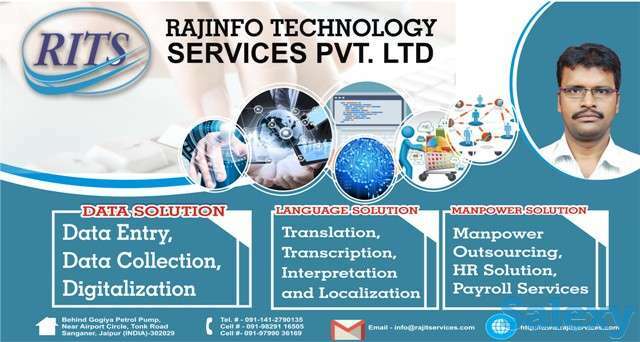 I am delighted to introduce Rajinfo Technology Services Pvt. Ltd. as India based one of the emerging outsourcing Company for back office support services. The solutions that our company offers include HR Solution, Language Solution and Data Solution. In today's cutthroat competition not only corporate but also NGOs and Government sector are stressing to cut their costs by concentrating on their core areas and outsourcing business support services such as Human Resource, Administration, Accounts & Finance and all other back office support services. Inline to keep organizations focused on their core area, our company provides one stop support solution for back office operations by giving HR Solution that includes Manpower Supply for back office from entry level to middle level management and payroll, project and event staffing, ad-hoc manpower. Due to advancement in technology and digitization world has become a global village and therefore cultural exchange is at boom but languages are creating barriers for the same. To eradicate this language barrier our company provides language solution that includes Translation, Transcription, Interpretation and localization. In addition to above given services we provide Data Solution that includes Online and Offline Data Entry, Digitization, Market Research, Data Collection, Data Analysis and Report Generation. We are confident that the services being offered by our company are of utmost need for any organization and key to cut the cost to overcome the cutthroat competition.